One of the greatest advantages of using GIS is its capacity to combine layers of data into a single map. The following graphics illustrate how multiple individual layers (or themes) can be combined for the purpose of performing complex queries. 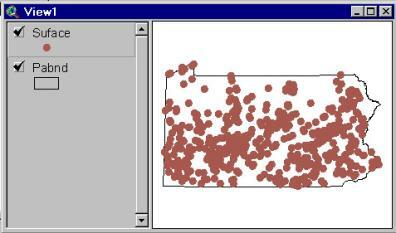 These points represent surface water supply locations throughout Pennsylvania. These lines represent Pennsylvania rivers. Pennsylvania county boundaries are represented by green polygons. The surface water intakes and rivers have been overlaid with the county boundaries to produce a single digital map that can be printed or used as input for both attribute and spatial queries. 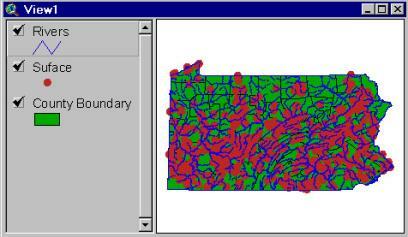 Layering data like this in a GIS allows users to analyze features in one theme, relative to features in another theme. The following example provides an illustration of a geographic query that involves multiple thematic layers.